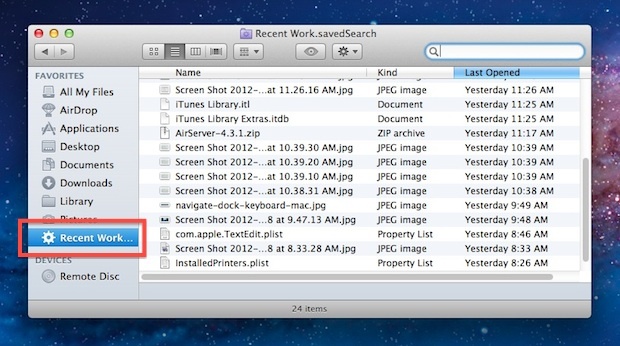 By using Mac OS X Smart Folders, anyone can quickly access all files they were working on yesterday without caring about where they were stored or what folders they reside in. There are two ways to set this up, the first will utilize a quick modification to “All My Files” and the second will be more inclusive by creating a custom Smart Folder. Alternatively, you can select “Date Last Opened” from the Arrange menu, though the moment you open a file it will move from Yesterday to Today in All My Files. The second approach uses a new Smart Folder to find all files that were modified within the past day, so if you modify a file from yesterday sometime today it will remain accessible in the same smart folder. This is a bit smarter than the All My Files method above, and it will also include user preference and library files, modified plists, iTunes playlists, downloads, and any other file that has been modified by the user within a day. The newly created smart folder is now accessible from any Finder window, just look for the gear icon next to “Recent Work” in the sidebar and click on it to open a constantly updated folder of all files modified within the past day. There are a variety of ways to further improve these Smart Folders, but to keep this article relatively simple we’ll limit it to a single search parameter for now. Worked for me, try again!